Full length radio documentary on jazz pianist and composer Vince Guaraldi documenting his life through the voices of Guaraldi biographer Derrick Bang and the many musicians, writers, and historians that crossed his path between the 1940's through the '70's in the San Francisco Bay Area. 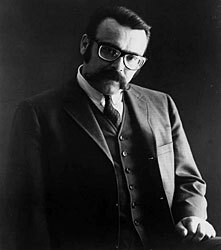 Jazz pianist and composer Vince Guaraldi was a mainstay in the San Francisco Bay Area from the 1950's through 70's. The composer of the hit, Cast Your Fate to the Wind and music for the Peanuts shows had a humorous, profound, and rather tragic story dying at the age of forty seven. Hear Guaraldi's story woven together with music and interviews with Guaraldi biographer Derrick Bang, musicians Eddie Duran, Colin Bailey, Larry Vuckovich, Dean Reilly, Richard Hadlock, and Peanuts co-creator Lee Mendelson. It's an original work written and narrated by Alisa Clancy, longtime audio producer, Program Director and Morning Drive time host at The Bay Area's Jazz Station, KCSM.